The path to opening the craft brewery of your dreams—as you probably know by now—is not a rose pedal strewn path to glory, riches and accolades. West Coaster magazine in San Diego recently posted on its blog (www.westcoastersd.com) a tale of one brewery operation’s slugfest with licensing officialdom. IS IT LITTLE MISS OR NEAR MISS? 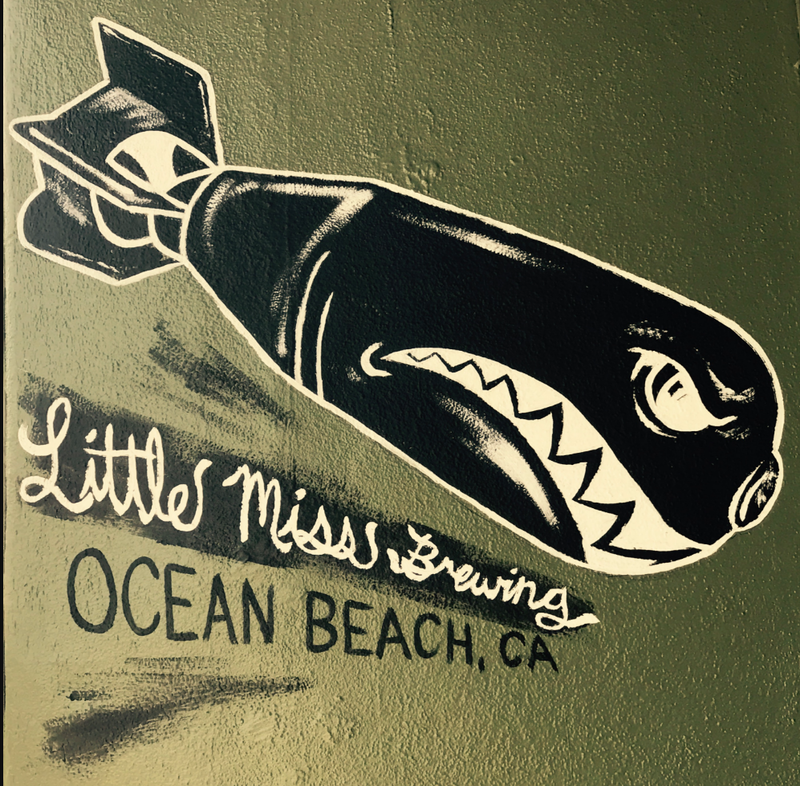 Earlier this month a for-lease sign went up beside the signage for Little Miss Brewing’s much-anticipated tasting room on Ocean Beach’s Newport Avenue. The conversion of the site’s interior into a French World War II-themed sampling space is roughly halfway complete and the company’s logo has been mounted outside, making this an unexpected turn of events for everyone, including owners Greg and Jade Malkin. The marrieds behind this Miramar-based company’s satellite project have been paying rent on the space since last December and, in the time it has taken to attempt to obtain approval from the local faction of the California Department of Alcoholic Beverage Control (ABC), have opened another tasting room in Normal Heights. But the ABC process for their would-be OB interest has been nothing short of a bureaucratic nightmare. The Malkins submitted their ABC application for the OB tasting room a week after sending the same paperwork for the Normal Heights project. Early on, things went as expected, including receipt of protests during the 30-day period when residents are allowed to formally raise issues. The majority of the protests were rescinded once the Malkins reached out to the individuals who had initiated them. What the Malkins were unaware of, however, is that a private meeting had been held without their notification or knowledge in late-April—outside of the public-protest period—between ABC supervisors, representatives of the San Diego Police Department (SDPD), a State Assembly member and additional OB residents not in favor of the tasting room. ABC representatives claimed the meeting was not specifically about Little Miss, but rather all tasting-room licenses pending on Newport Avenue, but Little Miss’ was the only license of that type pending at the time. The negatives that came out of that meeting, where the project was scrutinized without the applicants being able to defend their business, followed the Little Miss project file through its lifespan without the Malkins even knowing. But this constitutes only a portion of the obstacles. While the Malkins respect the job and authority of the ABC and appreciate the hard-working nature of ABC employees, they echo the opinion of most (including ABC employees) that the department and its local offices are severely understaffed during this time of unprecedented brewery openings. During the many months they spent trying to open the OB tasting room, meetings with ABC agents typically yielded little in the way of concrete answers or reliable advice. Often, one agent would contradict the other. In the cases where they agreed, other governmental factions saw things differently. Additionally, the Malkins were told to call ABC reps at different offices as well as various individuals at the City of San Diego offices and SDPD. Most calls went unanswered, as did requests for information. The key piece of info they coveted during the process were crime logs. During a meeting with the ABC on July 20, the Malkins were shown a letter from the SDPD dated June 29 stating it would not support the issuance of Little Miss’ OB license. The reason: the neighborhoods the Western Patrol Division serves (Ocean Beach, Hillcrest, La Playa, Linda Vista, Loma Portal, Midtown, Midway District, Mission Hills, Mission Valley West, Morena, Old Town, Point Loma Heights, Roseville-Fleetridge, Sunset Cliffs, University Heights and “Wooded Area”) had experienced an overall increase in crime and could not handle another ABC license issued in the area. The ABC said they would not go against the SDPD’s recommendation because they felt it was impossible to change their opinion. Determined to give that a try on their own, the Malkins asked to see the crime reports for the aforementioned communities. The ABC had those reports, but said they were not allowed to provide them to the Malkins, and directed them to obtain the data from the City. They attempted to do so, but after more unanswered calls, ended up downloading the information they needed from the City of San Diego’s website instead. Through this fact-finding exercise, they discovered that, although alcohol-related crime had gone up in the Western Patrol Division’s patrol area as a whole, it had gone down in OB by a whopping 40% since the November 2014 introduction of the neighborhood’s first brewery tasting room—Culture Brewing Company on Newport Avenue. Also, the number-one alcohol-related crime in OB is open-container violations, primarily on the beach. They presented this information to multiple City Councilmembers, the Mayor’s office and ABC, even going so far as to waive Little Miss’ ability to sell packaged beer or growlers to go, but never received an answer. The final straw was a call earlier this week when the Malkins say it seemed like someone at the ABC had decided they were going to deny the license long ago—possibly as far back as the meeting that they weren’t given the opportunity to attend—but nobody wanted to be the bearer of bad news. It prompted them to officially pull the plug on the OB project. This drama isn’t the only turbulence for the company, which last week parted ways with the only brewmaster it has known during its first year of existence. This seems a much easier hurdle to get over than ABC issues. Former Green Flash Brewing Company brewer Joe Lisica spearheaded brewery and tasting room construction and beer production for Little Miss. His desire was to create clean, clear beers, including an assortment of single-malt-and-single-hop (SMASH) beers. While quality was never an issue and ownership appreciated Lisica and his beers, their vision for Little Miss’ portfolio was vastly different, leading to an amicable parting of ways. Mike Morbitzer, a fellow Green Flash alum Lisica hired as his assistant, has been promoted to brewmaster and will be responsible for reshaping Little Miss’ offerings to match the Malkin’s desires, which includes more new-school beers such as hazy IPAs and beers brewed with fruits and other adjuncts across varying styles. Meanwhile, Lisica is taking a brief hiatus from the industry to contemplate his next move, while entertaining offers from companies in need of his services. Little Miss’ business model from the get-go has been to open six satellite tasting rooms under their manufacturing license, focusing on unsaturated neighborhoods — besides the planned OB location. The Malkins are leery of filing through the San Diego office again. A local ABC agent advised them to apply in La Mesa, a municipality that only recently began encouraging brewing companies to lay down stakes, but they will also likely look north once they have some time to gain some distance and lick their wounds—By West Coaster Staff. PillartoPost.org is a media partner of West Coaster craft beer magazine and website. Both are based in San Diego, California.